A-HOTEL.com - Halpa ja Hotellihuoneen Ulldecona, Espanja. Majoituksen varaus Ulldecona ja ympäröivä. Tätä ohjeellista tarjous on peräisin viimeksi varattu majoitus Ulldecona ja lajitellaan alimmasta hinnasta. Voit valita majoitus mieleisesi suosittelemme valita yhteensä 1 tarjoaa majoitusta Ulldecona. Syöttämällä haluamanne päivämäärät Ulldecona ja käyttäen suodatin työkaluja voit lajitella parhaan mahdollisen majoituksen sinulle.Tuli haluamanne päivämäärät ovat ratkaisevia tarkin tarjouksen, koska se saa kaikki verkossa tietoa hinnoittelusta ja majoituksen saatavuus. Sitten voit varata valitun Ulldecona majoitus (hotellit, jne.) heti. Hotel Bon Lloc in Ulldecona features a garden and a terrace. Boasting a shared lounge, this property also provides guests with a restaurant. Two-Bedroom Holiday Home in Alcanar is set in Alcanar. This holiday home offers accommodation with free WiFi. 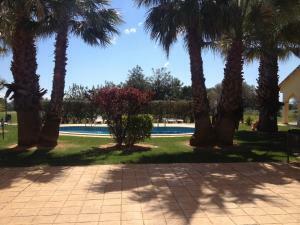 Three-Bedroom Holiday Home in Alcanar is located in Alcanar. Guests staying at this holiday home have access to a fully equipped kitchen. Set in Les Cases d'Alcanar, Ten-Bedroom Holiday Home in Alcanar Platja provides a private pool. Guests staying at this holiday home have access to a fully equipped kitchen. Featuring air-conditioned accommodation with a terrace, Holiday Home Les Cases d'Alcanar Marjal 46 is set in Les Cases d'Alcanar. The accommodation is 31 km from Peñíscola. Two-Bedroom Holiday Home in Vinaroz provides accommodation with a kitchen, located in Vinarós. The holiday home offers an outdoor pool. Holiday Home Marinada 1 is set in Alcanar. This holiday home provides air-conditioned accommodation with a terrace. Offering free WiFi, Alberg Els Josepets is set in Les Cases d'Alcanar. A continental breakfast is available every morning at the hostel. Just 8 km from Sant Jordi, Villages Golf Panoramica is located inside the golf club complex. It offers an outdoor pool, a restaurant, and smart apartments with a balcony or terrace. Set in Les Cases d'Alcanar in the Catalonia region, Camping Cases provides accommodation with free WiFi. The camping provides guests with a terrace, a seating area, a TV, a fully equipped kitchen with a microwave, and a private bathroom with shower. Located in San Rafael del Río in the Valencia Community Region, this holiday home is 28 km from Peñíscola. The property is 38 km from Morella and boasts views of the garden. These air-conditioned apartments are just 150 metres from Playa de Les Cases d’Alcanar Beach and the marina. The Delta de l’Ebre Nature Reserve is about 25 minutes’ drive away.